The Owen Remembrance Quilt is a hanging testimony that honors the lives of many served by Owen Funeral Home. The quilt is displayed as a reminder that as long as we live, our loved ones also live as we remember them. Each quilt square is unique and represents what is special to each family about their loved one. 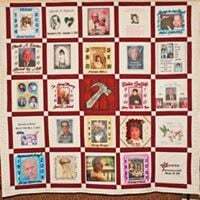 We are preparing to dedicate our 12th Owen Remembrance Quilt on Sunday, June 2, at 2:00 pm at the Hillview Community Church, 5319 Dixie Highway. We invite family members and friends to join in this dedication service along with a reception that follows. Our next quilt is dedicated to 20 unique and loved individuals. Through-out the year we will rotate the completed quilts,so that all the quilts are viewed in the years to come.